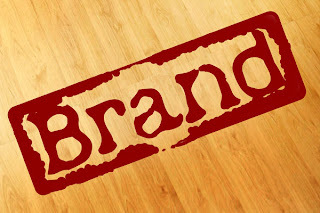 Branding is about being remembered. It's not easy to get your own brand recognized by the public. Big companies spend a lot of time and money to get recognized across the country. People know the logo on their soda can immediately, but those companies have been putting out ads for many decades. You can create a brand for your small business, too. Since you probably don't have a big budget, here are some tips for branding your small business effectively and efficiently. You need a motto, a mission and a creative saying. This needs to be an easy and quick phrase that identifies you with the public. "ABC Sports shoes, on the right foot," or "XYZ Herbal Drink, drink to your health!" It's important to stretch your advertising as far as possible, and this means choosing the right media. You need to find your target audience and focus there. If you run a chain of kid's toy stores, then don't spend £500 on one big ad in the local newspaper. Instead, spend £50 each on an ads in 10 local school newspapers, and buy ad spots in the school sports/event fliers. Target your ads. Sponsor local events to get some attention. Often the local media will cover these events, so you get free advertising. If it's a charity event, you also get some extra goodwill in the community. Brand an assortment of inexpensive items, from pens and pencils to magnets and key chains - all with your logo. Give these out like candy to your customers. Spread the word with little gadgets bearing your logo and website address. Have T-shirts printed with your logo and tagline. Spending £1000 on these items will go a lot further than the same amount spent in print advertising. These small gifts will remind customers of you each time they get used. Branding is about remembering. Don't let consumers forget you're out there. Bombard them with ads, freebies, events and press releases on a regular basis. Regular and consistent exposure wins the race. 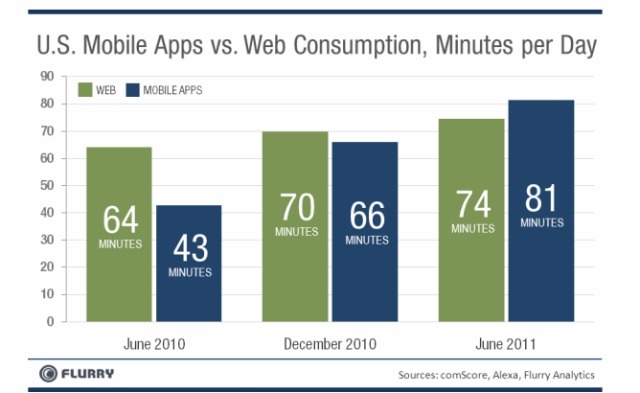 Consumers are spending more time on mobile apps than on the web for the first time, a new report claims. Flurry compared its mobile data to stats from comScore and Alexa, and found that in June, consumers spent 81 minutes per day using mobile apps, compared to 74 minutes of web surfing. (See chart below.) The shift comes as combined tablet and smartphone shipments eclipsed those of desktops and notebooks for the first time, according to a recent report by Mary Meeker, partner at Kleiner Perkins Caufield & Byers. 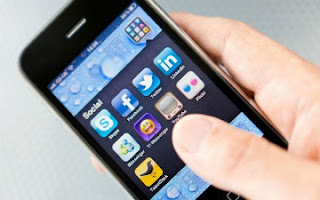 Flurry found consumers spend 9% more time, on average, using mobile apps. The report found that the growth in mobile app usage came mostly from more sessions per user, rather than longer sessions overall. Those sessions, by and large, are consumed by the use of games and social media apps, which took 47% and 32% of the total amount of time used for such apps. If the stats bear out, the data is vindication for Wired, which last year declared “The Web is Dead,” and predicted that apps would soon overtake it. Do you want to get the most from Twitter? Because Twitter is so quick and easy to use, it’s also easy to get lost in the conversations. Here are four tips to help you focus your Twitter efforts to get the maximum benefits for your business. Take something you want to accomplish in your business and break it down into action items that are measurable and specific. 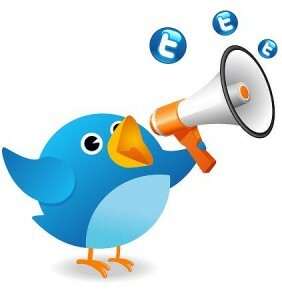 Use Twitter to reach out to potential customers who live or work within 3 milesof your location. Use Twitter to share your dinner special on Tuesday nights in June. Use Twitter to talk with neighbors about an upcoming community event for 3 weeks before and 1 week after the event. Here's an example of sharing about dinner specials. An objective describes what you’ll do and how you’re going to measure your success toward meeting your goal. You may want to add in other numbers related to outcome of your activity. However, those numbers depend on factors outside your control. You don’t know how many Twitter users live and work within 3 miles of your business. You don’t know how many people will visit on Tuesday nights based on your tweets. You don’t know how many people will be talking about the community event on Twitter. When you’re starting out in social media, it’s best to focus your objectives on something you can control: your behavior. Create objectives that guide your online behavior and watch how your community responds. Over time, you can fine-tune your actions so you can get the best responses from your community. Your business goals and objectives are the backbone for measuring your Twitter success. If you don’t already have Twitter goals and objectives, take a few minutes now to write down the practical ways that Twitter can help your business. It’s not enough to follow people. If you really want to build a Twitter community around your business, you need give people a reason to follow you back and engage in conversation with you. People will follow you if you talk about things that interest them. Of course, you can talk about your business, offer discounts and exclusive specials, share practical tips and announce your business products and services. Be mindful that you need to talk about things that others find interesting if you want to build a community. Choose your conversation topics carefully because it’s important that you really care about these topics. People can tell if you really have passion for a subject, or if you’re just showing up to sell them something. If you were having a dinner party, you’d spend some time cleaning up your house. In the same way, take some time to think through your conversation strategy and put it in place before you invest time searching for new people to follow. This way, when people check your Twitter profile, they can see what you talk about, how much you promote your business and how often you talk about other things. It’s important that you create a good first impression when people look at your tweet stream. 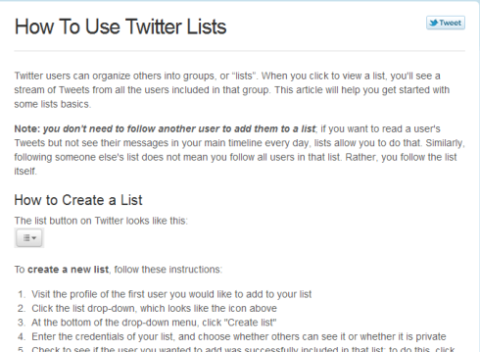 Before you expand your Twitter community, invest a little time to organize your existing community with Twitter Lists. Twitter Lists help you focus on conversation streams. If you haven’t used the lists feature, Twitter provides a great overview on how to create lists and manage the people on your lists. 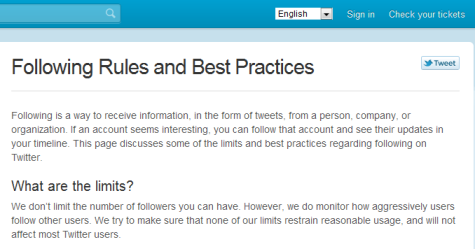 Twitter gives you a great overview on how to use Twitter Lists. There are no rules about how to break up your community into lists. Do whatever seems smart to you. You could create a list that groups together people who tweet in your neighborhood, another list for customers and yet another for businesses in your industry. You might want to see how other businesses are organizing people into lists before you finalize your strategy. Here's an example of how a business broke out their local community into several Twitter Lists. Twitter allows you to create public or private lists. Private lists. You’re the only person who knows about your private lists and who is on them. You can edit your lists (add or remove people) without anyone seeing your actions. Many people create a private list for the people they talk with most on Twitter. Public lists. Public lists are the most common and have many benefits. People love being on lists. Anyone can view and follow your public lists and you can follow public lists created by other people. 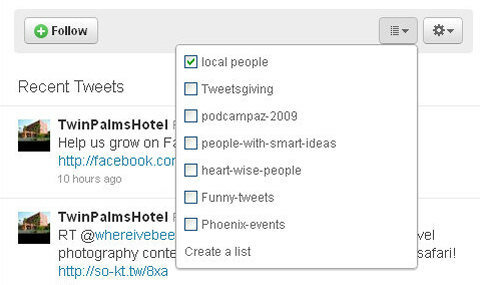 Create your lists and organize your current Twitter community. Add each new person you follow to the appropriate list when you follow them. 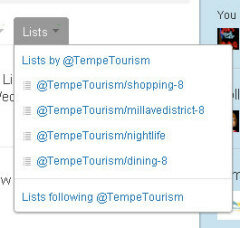 Use the list button to add each new person you follow to the appropriate list. 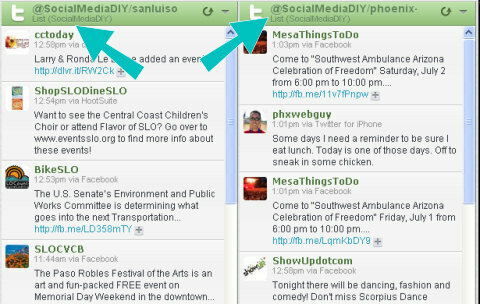 Many Twitter tool such as HootSuite or TweetDeck allow you to create separate columns for each list. This makes it easy to follow and join in conversation streams. HootSuite allows you to create a conversation stream from a Twitter List. Community management, the process of adding and removing people from your Twitter community, is an ongoing activity. Set aside some time each week to maintain your Twitter community. Start small and build over time. For example, you might set an initial objective to find 10, 20, or 50 new people to follow each week depending on your business goals and your available time. It’s important that you don’t follow too many new people at one time. Twitter spammers aggressively follow a large number of people in short bursts. If you act like a spammer, someone might report you as such and Twitter might suspend your account! Twitter monitors how aggressively users follow other users. In your weekly community management, set aside a little time to review your new followers. Rather than sending an autoreply direct message (DM) to new followers, why not look over the profile and tweet stream of each new follower and write a customized, personal message? To be a good community member, connect with your community as a real person and build your relationships one at a time. What’s your experience with Twitter? Do you have a community management strategy? Share your experience in the comments box below. SEO: It’s A Good Thing! As a reminer, SEO is not a crime, a harmful act nor something that only “bad” people do, despite what you may have seen on The Good Wife. It is, in fact, a helpful activity that even the search engines, including Google, recommend. SEO can be confusing to both new people and experienced folks alike. For new people, it can seem like rocket science, because you might get overwhelmed with all the details and miss the relatively easy general principles. For experienced people, chasing down which particular hot new SEO “tree” to climb can blind you to the overall forest that you should be considering. The Periodic Table Of SEO is designed to visually present the major factors, the biggest and most important things that can help you in gaining traffic from search engines. It’s focused on traffic from web search results, though down the line, we might produce similar ones for more focused search engines such as video or local. By the way, the Local Search Ranking Factors survey from David Mihm has just been updated. There are the “On The Page” factors, the things that a publisher can control directly. “Off The Page” factors, which are things you can influence indirectly about how others can help, or harm, your chances of search engine visibility. “Violations” are the things you should avoid, sometimes common mistakes that developers or others might not even realize shouldn’t be done. And “Blocked” covers a new class of not-violations but still things that can be harmful. Within each of these major groups are individual factors. There could be many more individual factors than we show. However, we’ve made a deliberate decision to show only those we think are most important, most consistently seen used by search engines, or verified by SEO data or commonly accepted and easily implementable. We don’t try to get into whether a word you hope to be found for comes first or last in the HTML title tag. Or whether an H1 header tag carries more weight than an H2 header tag. We don’t suggest that you need to use bold text. We avoid all that, because we feel it goes too much into unnecessary and possibly confusing depth for many people. Instead, if you know that your pages should have good, unique titles, that they should have structure that can be reflected by header tags, and that you should use the easily implemented description tag, you’ve probably covered 90% of the most important HTML-related factors. In addition, some of the factors we list are more general goals to reach rather than specific factors that can be implemented. For example, our social factors include attaining a good social reputations and good social shares. A good social reputation on Facebook? Or Twitter? And social shares on both, or only one — and what about Google +1? All of the above. Rather than getting lost on if Facebook or Twitter is better, or has more SEO juice, we want you to understand that social activity is increasingly having an influence on search rankings. So you want a good social reputation in a variety of networks. You want to be shared on a variety of networks. Those are among the most important general social goals you can go after. If you want a deep-dive into those types of specifics, SEOmoz does a biannual survey ofsearch engine ranking factors you should certainly read (it’s due to be updated very shortly). Our ranking factors table isn’t a replacement for that or others. Instead, we view it as a complementary guide. In particular, I personally hope that it’s the type of thing that anyone versed in SEO can use to help someone else get up to speed on the fundamental building blocks. Have you done Cr, research into keywords? Here are some tools to help. Or that As — site speed — is important factor. The factors are weighted on a scale of one to three, with three being deemed more important, though anything listed is deemed a fundamental. Not everyone may agree with how we’ve scaled things, but it’s a start. And everything’s relative. No single factor guarantees success, but having several of them increases the odds. I stopped maintaining this type of chart in 2003. In part, it was because a lot of the major “signals” or factors used by the different search engines were becoming more and more the same. The world also became more and more fixated just on Google, which in term was largely driven by rewarding those with the best links. I found it nice to come back years later and think afresh about how I’d organize the factors. It was also nice to put back on my graphics reporter hat, which I haven’t worn since I used to do infographics work in my pre-search engine life. Of course, I’m not an artist. Turning the periodic table into a great visual concept was the work of the good folks over at Column Five Media, which has a wonderful portfolio of infographics. It was a pleasure to work with them. Special thanks to Jason Lankow and Josh Ritchie. If you enjoy the chart, find it useful — please, reward our Cq with some Ln, Lt and especially Lq. Also appreciated is any Ss. Give us some Ce, too — comment are more than welcome. And the best with your SEO.